I never know what to expect during contest season. I always spend too much time agonizing over which photos to enter. While waiting for the results, I convince myself that everything I shot the previous year was awful. I would be humbled to come away with nothing more then knowing that my images were in competition with some of the best in the business. This year, I had a better showing than I could have imagined. The first results to come in were from the Illinois Press Photographers Association contest. This is a unique contest. It is a level playing field. There aren’t different divisions based on the size of the paper. Everyone is in the same pool. My underwater Gridiron photos received third place in the Sports Picture Story category. One of the frames from the Gridiron project also took third place for Portrait and Personality. The next results in were from the Illinois Associated Press Media Editors contest. The Rockford Register Star competes in the category with the largest papers in the state. 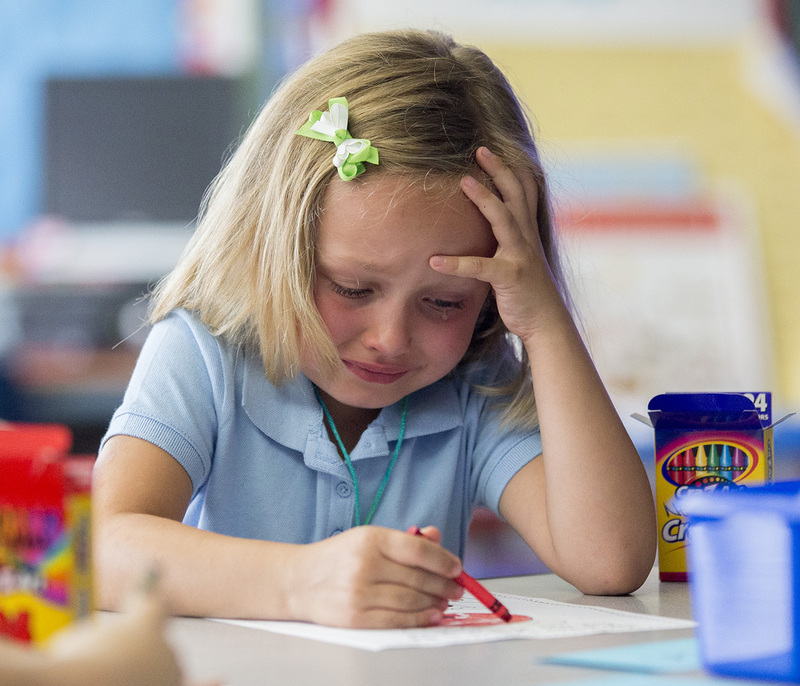 I received first place in General News for my photo of a student crying while coloring on the first day of kindergarten. That image was also named the winner of the Photo Sweepstakes in the largest division. The sweepstakes takes all of the first place individual category winners names one as the sweepstakes winner. I was also awarded first place for my Feature Photo of the Air National Guard practicing before Airfest. The latest results in are from the Illinois Press Association contest. We are in the second largest division in this contest. I took first place for Personality Portrait for an image of a man on Blackhawk Island in Rockford. I received third place honors for my Illustration for a story on underwater mortgages. The Gridiron photos received and Honorable Mention in the Picture Series category. The Air National Guard image also received an Honorable Mention in the Feature Photo category. We’re still waiting for the Best of GateHouse results. The Best of GateHouse results are in. I am humbled and honored to be named the Division A (large markets) GateHouse Photographer of the year. I was able to enter a portfolio with three entries. One was the photo of the student crying on the first day of kindergarten. Another was the picture of the Air National Guard pilot. Third was my underwater Gridiron photos (a series counts as one entry. The judges included commentary on the Gridiron images. I am honored to be named the Division A GateHouse Photographer of the Year. To those that helped make these images possible, thank you. Brent, Tim, I couldn’t have done the Gridiron photos without you guys. Saul (the fish), you really made that photo. Sorry I gave you away the same day I bought you. Reporters and editors at the Rockford Register Star were also recognized for their powerful work. The entire staff was recognized in categories such as general excellence. I’d like to congratulate my coworkers and other media colleagues that were recognized for their stellar work.